He was grabbing for the eggs when I was trying to snap my recipe photo. Imagine that! So I’m doing what any stubborn Mom would do back at her stubborn child. I’m pinning and trying out new recipes to see if he’ll grab for the nutritious white globe one of these days! 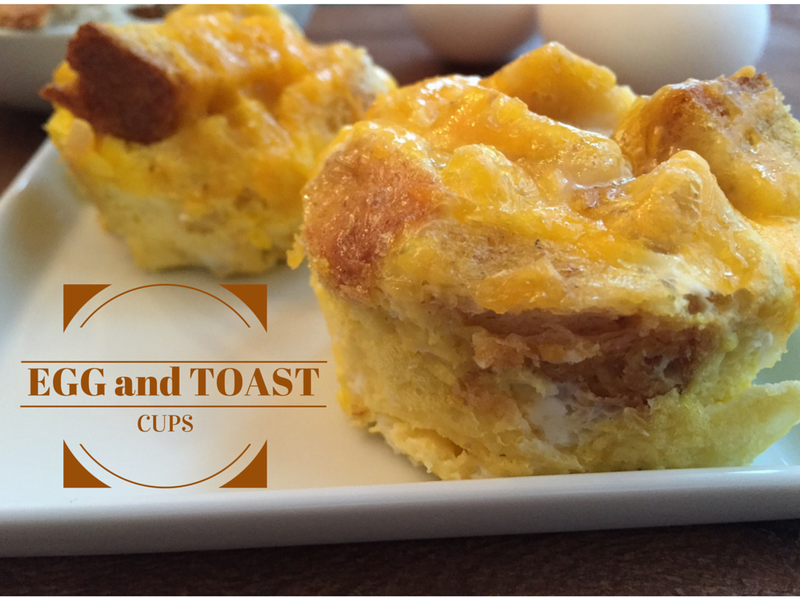 These egg and toast cups have everything I want in a breakfast: eggs, toast, and cheese. 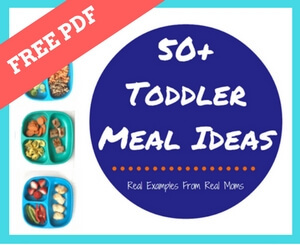 They are also the perfect toddler food [or perfect for any busy person on the go] because they are cooked in muffin tins, making their shape easy to grab n’ go. 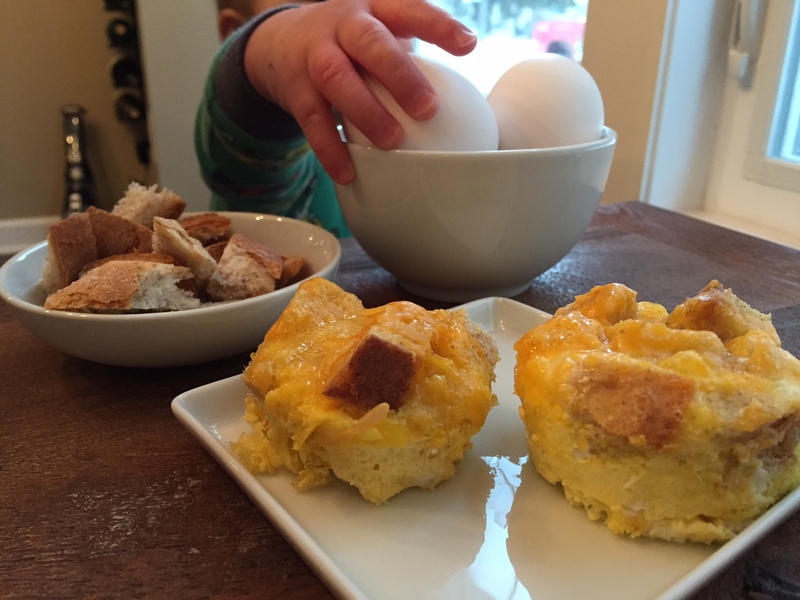 I’ve also read positive things about serving picky and choosy kids food in muffins tins— with the goal of sparking their interest in trying a new food! Nutritious AND minimal ingredients. That’s my kind of breakfast! Preheat your oven to 350. Grease a muffin tin pan [liberally] with butter or cooking spray. Fill each muffin tin with ¼ cup of the cubed bread. In a large bowl, combine the eggs and milk. Whisk until combined. Transfer mixture to a measuring cup for easy pouring. Pour egg mixture over the bread cubes in each muffin tin, filling it until each cup is almost full. Sprinkle 1-2 tablespoons of cheese on top of the egg mixture. Bake for approximately 15-18 minutes. Remove from the pan while warm. Serve immediately. Store in your refrigerator in an airtight container for up to 5 days and reheat in the microwave for 15-20 seconds. You can also store in your freezer for up to 3 months in an airtight container. Reheat in the microwave for at 30 second increments until heated through. Did Joey eat the egg and toast cups? Nope. He ate the toast and the cheese and threw the scrambled egg at me. But alas, there was some egg on that toast and cheese. So he DID get a little! I’m not giving up yet folks. If you have a picky eater who turns their nose up at eggs, what are some ways you tried to peak their interest in the food? Glad I’m not the only one who gets food thrown at me throughout the day! I think these look delicious and I my toddler would love them! Good luck with the eggs!! It’s such a game right now!! What a fun breakfast! Love that you combined the usual egg and toast into one! 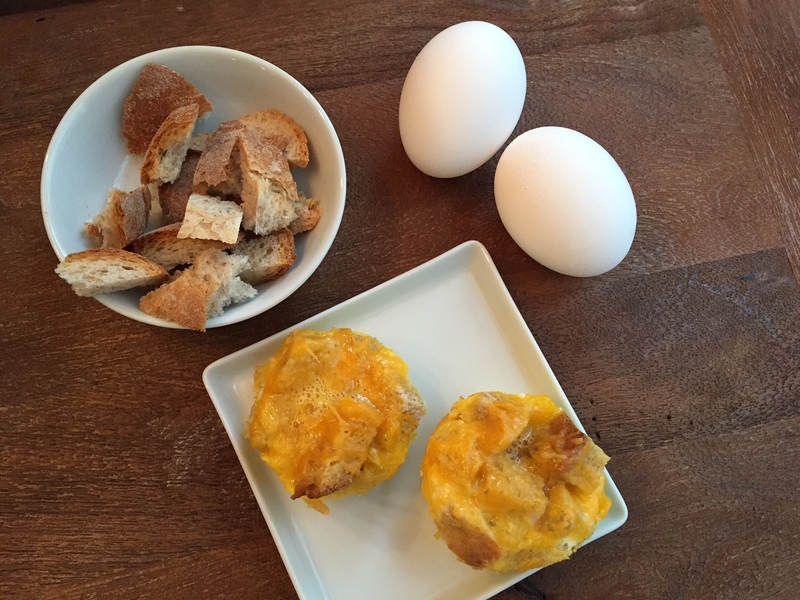 I’m a big fan of egg muffins (or egg cups, whatever you like to call them!). Fun for the kids and easy for moms and dads if you make a batch ahead of time and freeze. Just pull them out of the freezer, microwave, and breakfast is served! Exactly!! Do you add anything else to yours? Do they get mushy with reheating? ? Not really. They were pretty soft to begin with because I used more egg than toast. Kids can be so finicky. I think any child would love these. My husband would too. Next time I’ll add more cheese to see if he’ll eat them! I am definitely making these for breakfast tomorrow morning. They’re fast and easy, perfect for a school day! Thank you! How did you like them Jacqui? I love eggs and simple breakfasts and this seems to have both. I can’t wait to try this. Thanks Rachee!! I hope you enjoy! These are so fun and look like they’d be super convenient for a morning on the go. They are!! Wrap in a napkin and bam! Yum! These look awesome! I’m a fan of anything that is easy to grab and eat in the morning. Especially for my kids. I made these just minutes after finding the recipe on Pinterest. I used only 4 eggs and 1 slice of whole wheat bread and it made 6 muffins. I did forget to use cheese though. My 15 mth old liked them and I did too. I’ll be making more and I’ll be sure not to forget the cheese. Perfect!!!!! I’m so glad you liked them and so did your kiddo!